Studying medicine is demanding to say the least and most medical students barely manage to attend lectures and prepare for exams. But Mohit Karki claims to have made it a point to hit the gym for an hour every day throughout his college days. Yes, classes were grueling but working out, for Karki, was an escape, a release he couldn’t do without and he never compromised on it. Karki, who completed his MBBS in 2016, has always been interested in fitness. But after his SLC exams is when the interest started to take shape in real life. It all began with a little bit of running and a lot of cutting back on food (more like a crash diet), which Karki recalls to be a premature move on his part. “It’s not the weight on the scale that matters but the proportions of one’s body,” he reveals. A chubby kid who always wanted to get in shape, Karki went from 80 kilos to 50 kilos following a crash diet. However, he now realizes that is not the way to go when it comes to achieving your ideal weight. From February of 2013, Karki started giving fitness proper focus as well as time, all the while managing to do well in his MBBS program at The Kathmandu Medical College. Karki claims to have read books, journals by esteemed bodybuilders, fitness gurus who helped him better understand the importance of proper diet. This led him to become more and more conscious about what he put into his body. He started measuring calories, manipulating his intake of carbs and proteins according to his body’s needs etc. “Anyone can come into the gym and exercise for an hour but what you do for the remaining of the 23 hours, from resting to eating, is what determines how fit and healthy you will become,” he explains. After completing his MBBS course, Karki interned as a medical officer till 2017. Around this time, he also became interested in competing as a bodybuilder. So, in 2017, he participated in a bodybuilding competition “Mr Kathmandu” in which he bagged the silver medal in the 75-kilo category. Soon, many other similar achievements followed. One notable achievement was managing the highest weight in powerlifting (squat, bench and deadlift) in Nepal i.e. a total of 360 kilos. In 2018, he again competed in “Mr Kathmandu”, this time in the 90-kilo category, winning the third prize. 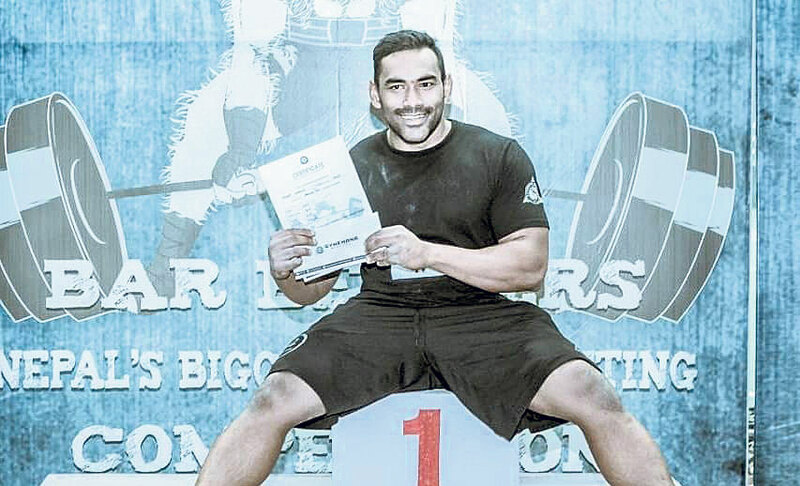 Karki hopes to take his bodybuilding journey further and compete in the International Powerlifting Federation (IPF). Along with going to the gym and maintaining his physique, Karki also prepares his own meal and is extremely careful about his nutritional intake. According to him, to be truly healthy, one has to be aware about the type of nutrition (be it carbs or protein) in the food one eats, keeping in mind the need of said nutrition for one’s body. And for this, he says, it’s always best to prepare your own food as you will be conscious about what you put in instead of trying to make out the calories of an ordered lunch. “If you wake up one hour early and prepare your meals, you can rely on them for the rest of the day and you won’t have the urge to eat something that is not good for you,” he reveals. For him, regular Nepali food does the trick in maintaining his physique, provided that it’s complemented by seasonal fruits and vegetables. Currently, Karki works as a nutritionist, diet consultant, and an occasional personal trainer at Gymkhana in Dharapati, Kathmandu, where he holds seminars on powerlifting, diet awareness etc. He also shares his opinions and hacks on healthy living on his instagram @dr_strength_ .He also hopes to impart knowledge regarding the need for diet awareness, with the help of his fellow athletes and experts, not only in Kathmandu but throughout the country. Karki mentions he wants to find the “middle ground” as a doctor and a fitness enthusiast by pursuing sports medicine for his post graduate studies. Along with the feel good and look good factor, Karki was drawn into bodybuilding and fitness due to the change it brought in him and his health. “With every waking moment I spent exercising, I knew I was improving and, somehow, this made me more fulfilled and happy,” he says. To him, waking up every morning and going to the gym was never a chore. It was more of a much-needed isolation away from the pressure of studying, meeting deadlines etc. According to Karki, if you are truly passionate about fitness and are willing to go the extra mile then you can most certainly balance work or social life and at the same time be able to take care of your health, diet, and fitness. “If I could do it, anyone can,” he concludes.